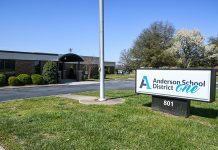 During their January meeting on Tuesday, Anderson School District One Board of Trustees approved a one year contract extension for Superintendent David Havird. The Board also approved the following personnel for the 2016-17 school year: Recommendations – Chandler Rushing, Self-Contained Intellectual Disabilities, Powdersville High; Lisa Offik, Science, Powdersville High; Ginger Phillips, Guidance, School District One. Requests for Leave – Kaycee Bowick, Self-Contained Emontionaly Disabled, Wren Middle; Jessica Mizzzell, Third Grade, Cedar Grove Elementary; Melissa Tollison, Assistant Principal, Powdersville Elementary. Resignation – Chrissy Faasse, Music Teacher, Wren Elementary. Administrative – Robbie Binnicker, Assistant Superintendent for Administration; Jane Harrison, Assistant Superintendent for Curriculum; Becky Brady, Director of Personnel, Travis Thomas, Director of Finance; Dr. Brian Keith, Director of Special Services; Lisa Cassidy, Director of Planning and Development, Christie Shealy, Director of Testing; Andria Hancock, Director of Technology; Chris Lesley, Director of Maintenance.